As Autumn is approaching, it is now time to update you on our latest work! 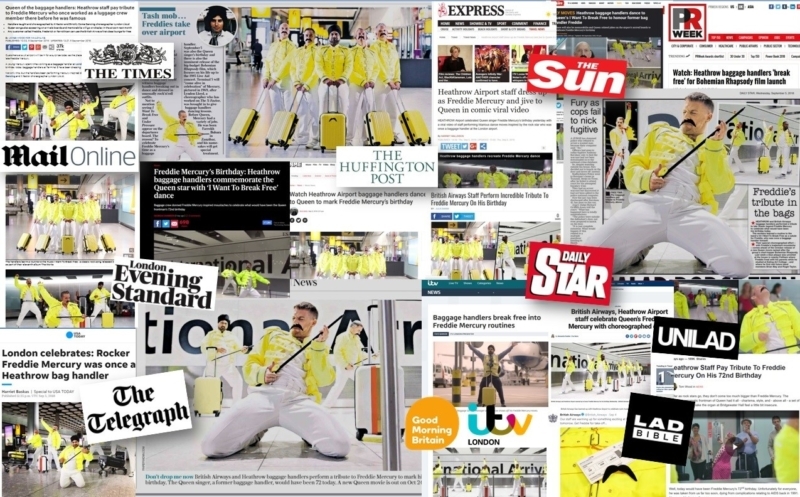 Over the past week, we have been heavily featured in the Press as we unveiled United Production’s latest project, Freddie Mercury Tribute event held in Heathrow Airport in honour of Freddie’s Birthday. Mercury was an airport employee before joining Queen in 1970. The event tied with the release of upcoming Queen movie, Bohemian Rhapsody, celebrating the life of Mercury, produced by 20th Century Fox. Lyndon Lloyd worked on the performance, choreographing four real-life Heathrow Airport employees who performed a Freddie-inspired, routine on the day to Queen’s hit song, ‘I want to break free’. You can spot United Productions in numerous national and international publications, both online and offline. Forbes, The Times, The Telegraph, The Huffington Post recognised our work in their articles as they reviewed the tribute.